John Curry’s odyssey in the Pens organization has taken him to the Las Vegas Wranglers of the ECHL. Originally scheduled to begin the year with AHL Wilkes Barre-Scranton, the All-American goalie sustained a lower-body injury and missed the exhibition season. 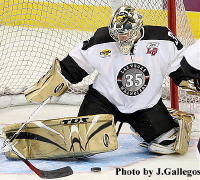 The Pens brought in ex-UNH goalie Ty Conklin and sent Curry west where his arrival meant that his former Terrier teammate, Stephan Siwiec was cut from the roster. Skating into the Wranglers’ crease, Curry, now wearing #35 has excelled. He won his first two starts, giving up just one goal in each game and earning ECHL goalie of the week honors. In the first game, Curry kept former HE opponents Brady Leisenring and Brett Hemingway off the score sheet, but gave a goal to ex-RPI Engineer Oren Eizenman. Final score, 2-1 in OT. Curry must have felt right at home. Curry now is 3-0, although he did give up a pair of goals in the third game. He’ll likely return to the AHL sometime soon, but while in the Wrangler’s net will find himself facing ex-teammates Matt Radoslovich (Fresno) and Bryan Miller (Anchorage). Ryan Whitney’s sweet pass (video) produced the only goal in Tuesday’s Penguins-Rangers game. Whitney’s bullet pass banked of Evgeny’s Malkin’s stick and trickled across the goal line. Junior defenseman and second team All-American Matt Gilroy, who scored BU’s only goal against UNH, guested in a CSTV.com chat earlier in the week. The chat transcript provides some insights into Gilroy’s decision to resist the offers of NHL scouts last spring and return for another year at Agganis Arena. New England Hockey Journal profiles NTDP U18 coach John Hynes, who also will behind the bench for the U.S Junior National Team in this year’s World Junior Championships. Terrier defenseman Brian Strait, captain of Hynes’ 2005-06 U18 squad that won the World U18 Championship, describes his singular approach to preparation. Hynes, a member of BU’s 1995 NCAA Championship team, began his career as a graduate assistant on the Terrier staff and later was assistant to David Quinn when the current BU associate head coach led the NTDP program. BU’s Alumni office announced a “Men’s Hockey Watch Party - BU vs. Michigan” this Friday in New York City. "Standings Bar is hosting a special party for this exciting game -- sound will be on and free pizza will be served! When: Friday, October 26, 2007, 8:00 p.m.
Friday's game against Michigan is on CSTV and if you don't get that channel, try this site to watch online. Saturday's 8:30 p.m. start is on Comcast's CN8 in New England which can be accessed at CN8Live. Earlier this week, we reported on Matt Gilroy’s younger brother, Kevin, who plays for the EJHL South Shore Kings. So, in the interest of fairness… Kevin Shattenkirk’s older brother, Keith, a senior forward playing for Princeton, scored the game-winner in the Tigers’ 6-4 exhibition win over Trois Rivieres.